The Friends of the West Highland Lines promote development of the train services through the West Highlands. We want high quality trains, more frequent services, through tickets and reliable connections with ferries and local buses. Better transport for local people and visitors will increase accessibility and benefit the economy of the Highlands. To view our Constitution click here. 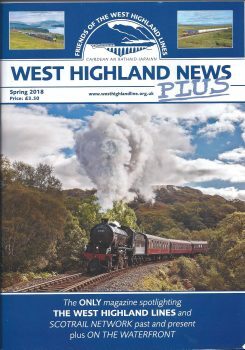 The Friends publish a magazine, West Highland News Plus, three times per year containing the latest news, photographs and historical articles covering the WEST HIGHLAND LINES, plus the SCOTRAIL NETWORK, and ON THE WATERFRONT ferry news. This is free to members of the Society. Members can also attend our AGM which is normally held in the spring at locations on the West Highland Lines. The range of guest speakers over the years have given interesting insights into the operation and organisation of rail transport through the rugged countryside of the West Highlands. See the News Section for the latest information. The Society actively engages with Scottish Parliament Ministers, Transport Scotland, ScotRail, Network Rail and is currently co-operating with new Community Rail Partnership (CRP) initiative for Scotland. The Society has made a considered response to the Scottish Governments new ScotRail Franchise ITT and had meetings with all five companies bidding for the new franchise which commences in 2015. The Society is very active in the recovery of scenic views which have been lost as a result of increased lineside vegetation growth; sometimes referred to as the ‘Tunnel of Trees’. This has involved detailed co-operation with Network Rail, their approved contractors, and support and finance of organisation such as the Loch Lomond & Trossachs National Park Authority and The Highland Council. For a brief outline History of our Society and achievements click here.